December 6 marked 600 days since the abduction of about 300 Chibok girls by Boko Haram militants. 600 days of anger at the insecurity, at the radical zealots taking advantage of it, at the crippling uncertainty about the girls’ welfare, and who the militants might attack next. 600 days of sustained advocacy. 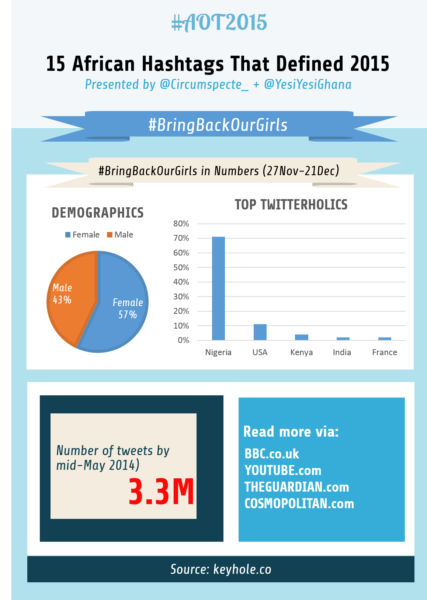 #BringBackOurGirls has proven to be a very controversial case study on activism, started and centred on the internet. First used in April 2014 in Nigeria, the hashtag brought much-needed attention to the abduction, a fact highlighted by Time Magazine’s 100 Most Influential People feature on hashtag creator Dr. Obiageli Ezekwesili. With personalities like Michelle Obama pitching in, the hashtag was used in a reported 3.3 million tweets, pushing it to trending status. A year later, the rousing support #BringBackOurGirls garnered has withered significantly and promises of assistance in rescuing the girls have gone unfulfilled, despite the former education minister’s inexhaustible hope, work and reminders. Though the fate of the girls is still unclear, the fight persists and others like Dr. Ezekwesili continue to work in whatever way they can to bring back the girls. The question now is, who is listening? Africa has been called a lot of things. Some pleasant, others not too pleasant. But what if #IfAfricaWasABar? Who will be the guy standing by the entrance to the toilets selling packs of gum and squirts of perfume? Who will be in the VIP lounge drinking expensive champagne? Who will steal the dance floor? 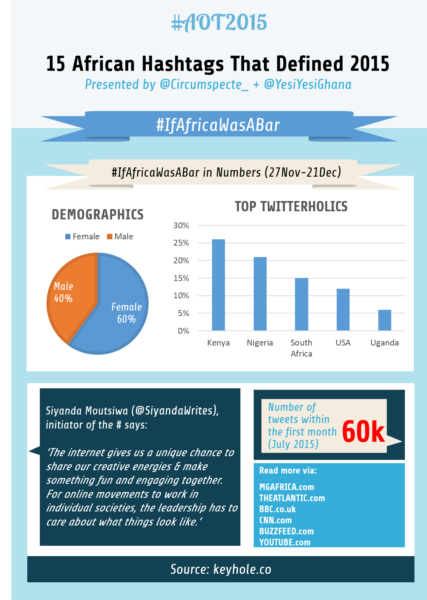 Started by Siyanda Moutsiwa, the hashtag #IfAfricaWaABar invited African Twitter to say what they thought of each other and African Twitter didn’t disappoint. Soon after the first tweet went out, the virtual bar was in full swing and the banter came in hard and fast. The tweets highlighted our creative abilities but more importantly, they carried within them our perceptions of the nations around us. So here’s the moral of the story – if you want to know what people really think about you on Twitter, offer them a virtual bar and some virtual alcohol. Yeah alcohol, because no good story started with someone eating a salad. Are miniskirts an ‘invitation’? Who gets to decide what “indecent dressing” is – if at all? Is #MyDressMyChoice? Does it even matter? This is what followed a disturbing YouTube video of a Kenyan woman stripped by matatu touts (public bus drivers) in central Nairobi in 2014. Her alleged crime: indecent dressing. 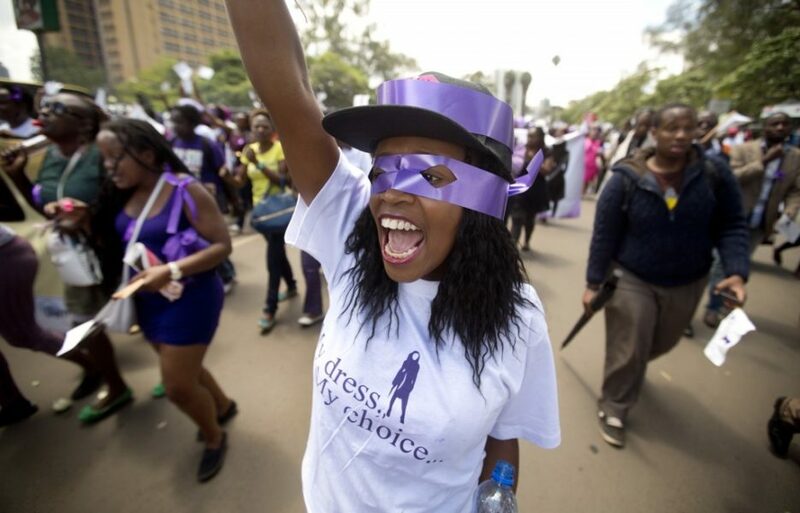 Initially created to protest the string of mob assaults on Kenyan women, #MyDressMyChoice took on a different tone in November 2015 as activists mourned the untimely death of hashtag creator and women’s empowerment champion Ruth Knaust. Thanks to Knaust and her cofounders, #MyDressMyChoice became a rallying cry of support for sexual violence victims which converged hundreds of people in peaceful protest in Nairobi and another 16,000 via the Facebook group Kilimani Mums. In addition to creating space for frank discussions on gender-based violence and “African culture”, spinoff hashtag #NudityIsNotMyChoice emerged, fueling an impassioned debate similar to those around Uganda’s controversial ‘mini-skirt’ law. Lurking behind it all, a chicken and egg conundrum: Is the world getting more violent (towards women and girls) or is social media simply exposing what was there all along? #IfAfricaWasABar then #WhatWouldMagufuliDo? Your guess is as good as mine. Tanzania will be that guy ordering free glasses of tap water all night. Uncool, but an extremely wise move. It’s called living within one’s means. Three weeks after becoming the president of Tanzania, John Magufuli shot onto the African Twittersphere with his penny-pinching ways. He placed restrictions on foreign travel by public servants, slashed the budget of an inauguration party for the new parliament from $100,000 to $7,000 and cancelled the country’s Independence Day celebrations, instituting a nationwide clean-up programme in its place. The man they call the “Bulldozer” was tearing down the old ways and the twitterholics in neighbouring Kenya were his loudest cheerleaders. The hashtag #WhatWouldMagufuliDo gave African Twitter the opportunity to mark their government’s spending against the new benchmark – John Magufuli. In a continent where governments routinely blow millions of public money as if it were confetti, Magufuli’s austere measures have been seen as revolutionary and a welcomed breath of fresh air. The world was none the wiser when Al-Shabaab militants attacked and killed 147 people at the Garissa University College on April 2, 2015. That is, until #PrayforKenya emerged. The attack by Al-Qaeda’s Somalia branch became Kenya’s deadliest since the 1998 US embassy bombing, and Kenyans started the hashtag to mourn and humanize the dead; posting names, photos, and memories of the victims. 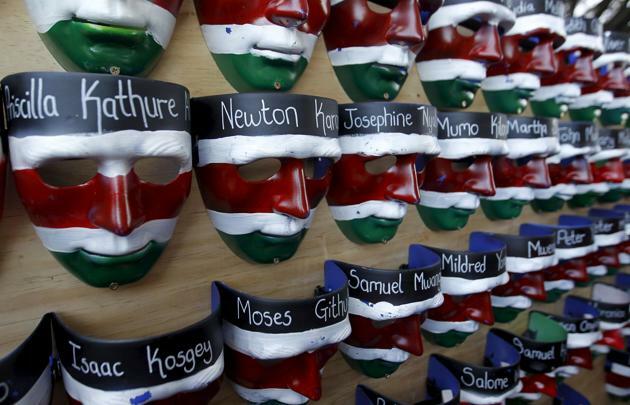 Ushahidi co-founder Ory Okolloh Mwangi launched #147NotJustANumber to honor each truncated life with character portraits, highlighting the impact of the tragedy on loved ones. Eight months later, #PrayforKenya resurfaced in protest of what many saw as a blatant disregard for non-Western tragedies. The trigger? Facebook’s safety check feature and French flag filters offered to users as a show of support following the #ParisAttacks. The debate raged on about just how much coverage each tragedy receives, and many used the hashtag to vent their frustration at African lives being treated as less important or inferior. Ultimately, hashtags like #PrayforKenya could contribute constructively to the global dialogue on solving and preventing the growing threat of terrorism, while sending a strong message about the worth of a life. 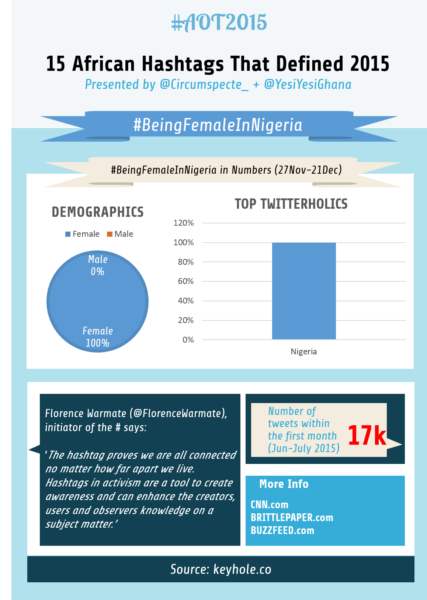 #WhatWouldMagufuliDo about the reality of #BeingFemaleInNigeria? 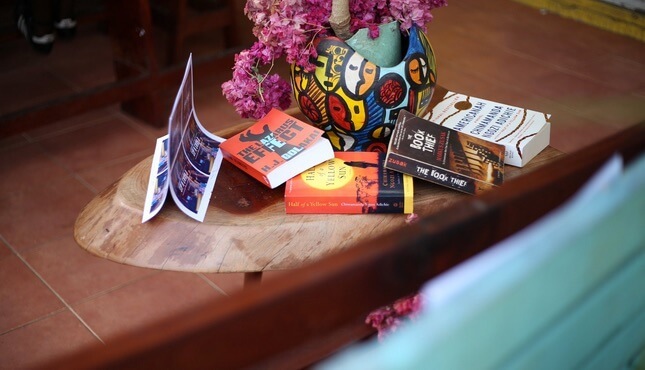 In June 2015, a small Abuja-based book club tried to tackle the issue of everyday sexism with 140 characters and African Twitter responded overwhelmingly. 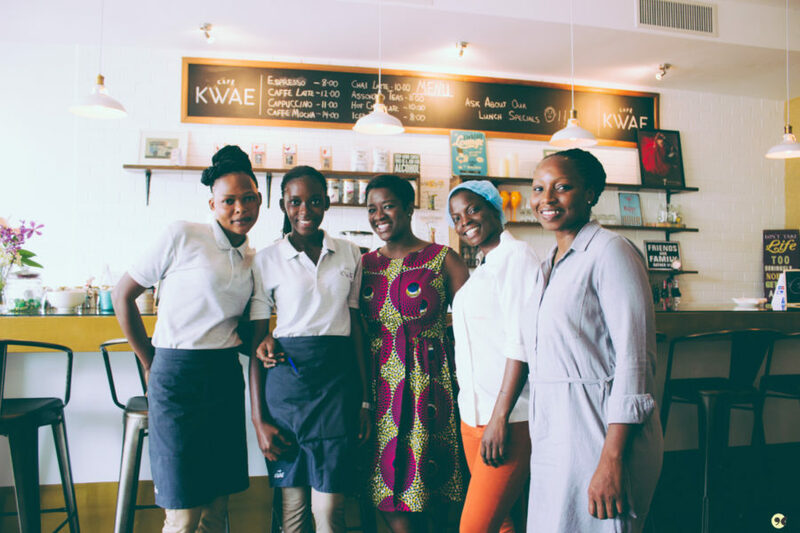 Inspired by Chimamanda Ngozi Adichie’s 2014 pocket-sized book: ‘We Should All Be Feminists’, Florence Warmate and her group sparked a conversation across the African Twittersphere about everyday sexism. 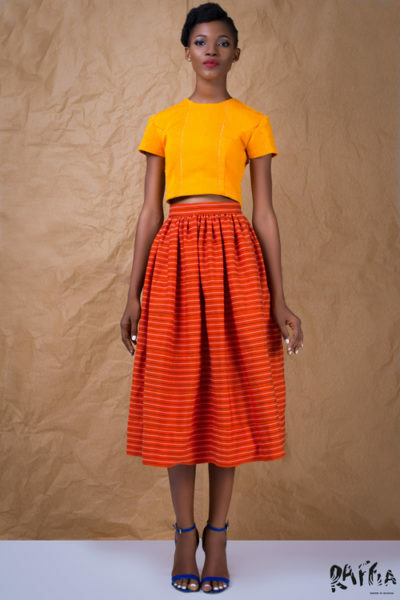 With the hashtag going viral, Nigerian women were confronting the cultural and religious dogmas that underpin the gender inequality that is so pervasive in our society. 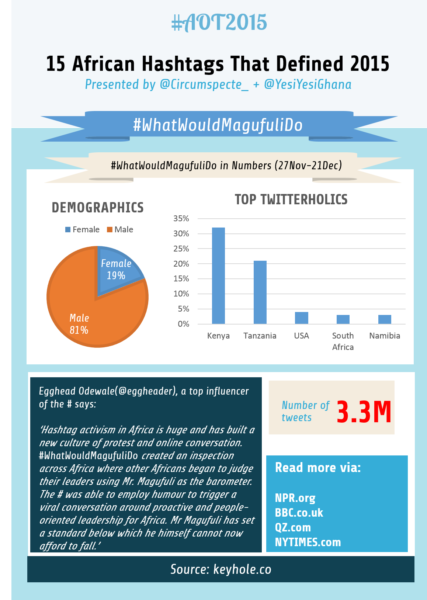 So we ask again #WhatWouldMagufuliDo about the reality of #BeingFemaleInNigeria? Judging by his austere stance, he will probably ban all misogynists from eating, touching or even smelling Jollof until they change their ways. Africa has always had an image problem with the media or more accurately, with the rest of the world. The starving African baby or the curious planet to be observed from a safe distance – either could be a fitting mascot for Chimamanda Adichie’s cautionary tale on the danger of a single story. Fed up with the drone of a continent misrepresented, some Africans took it upon themselves to properly parade the home they know all too well. #TheAfricaTheMediaNeverShowsYou caught fire quickly with reports of it being shared about 42,000 times on Twitter alone, merely days after it was created. Across Facebook and Instagram, stunning scenic and hitherto unseen images of mouth-watering cuisine, iconic cultural architecture, radiant smiles, scintillating landscapes, magnificent murals and thriving livelihoods colonized the internet. While the hashtag’s origin is unclear – some reports link it to Rachel from Ghana while others reference Diana Salah – one thing is for sure: on a regular June 2015 day, the script on Africa was flipped and everyone was invited. The hashtag is still being used as a counter narrative to all the negative images and perceptions the world has of Africa and as they say, the Internet does not forget. While we are looking at the ugly side of #BeingFemaleInNigeria and the ignorance that feeds it, #SomeoneTellCNN that carelessness, sensationalism and conscientious stupidity is anything but attractive. 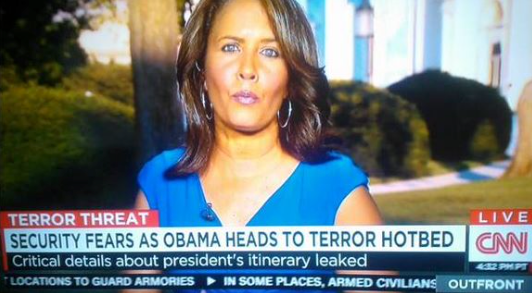 When CNN carelessly labelled Kenya as a “hotbed of terror” ahead of the US President’s visit, the Kenyan twitterholics responded brilliantly. With the hashtag #SomeoneTellCNN, Kenyans countered the inaccurate reportage with tweets and pictures highlighting the beauty of the east African nation. Contrary to what CNN will have us believe, Kenya is the second highest destination for tourism in Africa, a place where three former U.S. ambassadors chose to retire, and the preferred African headquarters location for many U.S. and international companies. Let’s just say CNN is the “hotbed of error”. 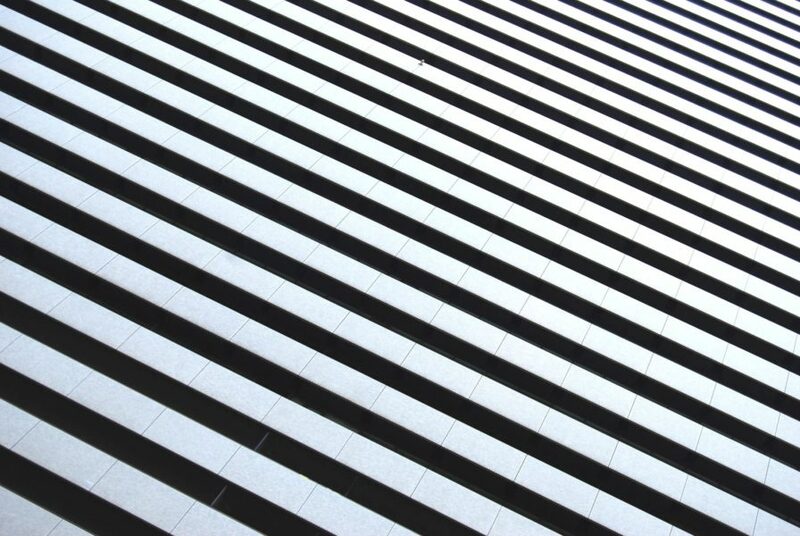 The line between private and public is gradually becoming blurry and, one could argue, almost imperceptible. No one knows this better than the six #Zone9Bloggers and three Ethiopian journalists who were acquitted in July and October 2015 after being imprisoned for over 15 months on “terror charges” for critical publications on the Amharic multi-contributor blog Zone 9. While there have been reports of African media workers being intimidated, harassed or even suspended from day jobs, the Ethiopian incident took things up a notch. 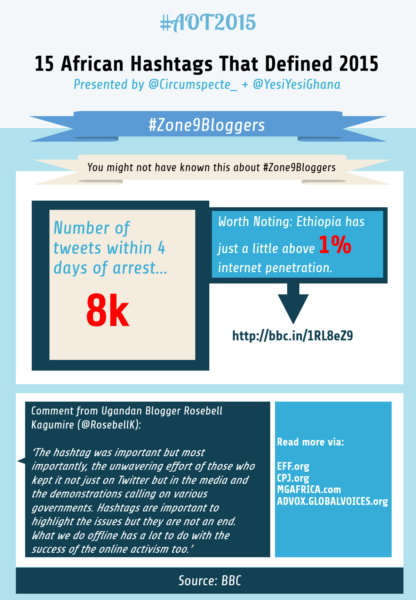 In response, African netizens and press freedom advocates used the hashtag #Zone9Bloggers to share and follow updates on the group’s drawn out ordeal which included over 20 court appearances. Locals also highlighted the lack of press freedom and government tactics for dealing with so-called dissidents in Ethiopia’s largely state-controlled media sector. The relevance, effectiveness, and enforcement of freedom of speech laws was center stage in many discussions, as was the timing of the acquittal which coincided with President Obama’s visit to the East African nation. There may be only two African countries on the 2015 list of most censored countries, but incidents like this highlight potential challenges for digital activists in other African countries. #SomeoneTellCNN that careless reportage and sensationalism will fall and South Africa’s rising university #FeesMustFall with it. In October 2015, thousands of angry South African university students marched on the historic Union Buildings, the seat of the South African government. With the hashtag #FeesMustFall as their battle cry, the rainbow nation’s ‘born free’ generation marched against university fee hikes and the pervasive inequalities that persist two decades after the end of apartheid. Where was President Zuma? Probably lost within his Nkandla country retreat which has been generously upgraded with about $23 million of the taxpayer’s money. Never mind that $23 million can support thousands of students through university. That would be the sensible thing to do but we know Mr. Zuma doesn’t do sensible. He does HIV-positive partners and showers afterwards to reduce the risk of being infected. Nkosi Sikelel’ iAfrika! Not too long ago, Pan-Africanism was a concept many believed in and even died for. Today, the concept seems to have melted under the African sun, and events like #XenophobicSA bring on nostalgia for the good ol’ days. South Africa’s history of xenophobia is rooted in the wounds of apartheid; wounds with scars that are still visible. A spate of anti-immigrant attacks resulted in at least 67 fatalities in 2008. In April this year, comments by controversial Zulu King Goodwill Zwelithini about foreigners “stealing” local jobs emboldened some South Africans to attack other African residents – primarily Ethiopian, Nigerian and Zimbabwean – in two of the country’s three largest cities. 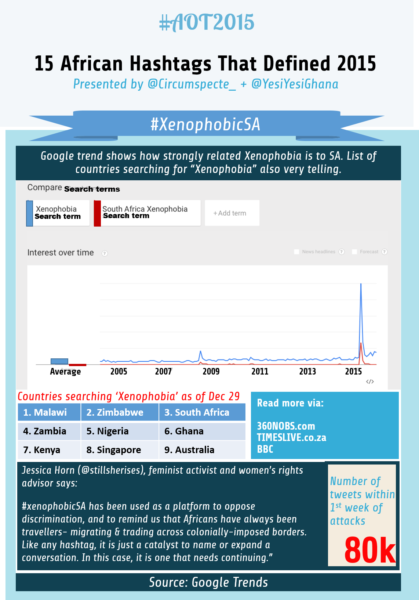 At least five people died in the attacks and the continent tethered between rage and sympathy, as depicted by over 80,000 #XenophobicSA tweets. Equally dominant on timelines were shocking images and videos of vandalism and machete-wielding gangs brandishing anti-immigrant sentiments. The incident further strained Nigeria-South Africa diplomatic relations. Perhaps the key question presented by #XenophobicSA is the relevance of hashtags: did the social media campaign help quell the attacks? Did it permanently destroy the image of South Africa in the eyes of foreigners? 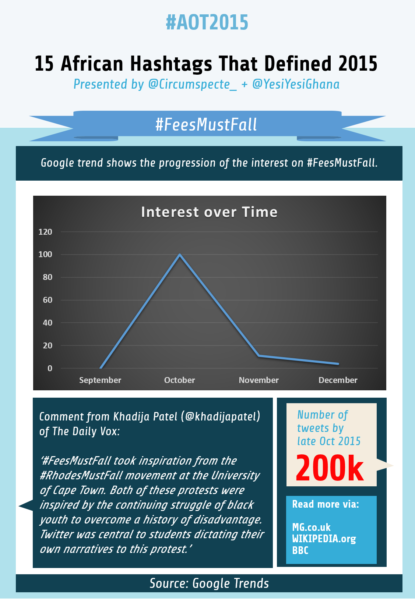 So the #FeesMustFall because nothing exploitative and obsolete stands forever. 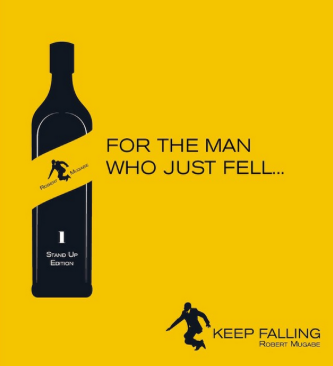 Even Grandpa #MugabeFalls, literally. The veteran leader of Zimbabwe who was 82 years when the first ever tweet was sent seems to be unable to walk himself down a set of steps yet he manages to clinch onto power like his life depends on it. His fall was an accident waiting to happen and when it did, African Twitter was present – in full force, to take jabs at the man who has, since 1987, presided over the decline of one of the world’s most resource-rich nations. Instagrammers also weighed in with over 1000 posts under the hashtag. Some press photographers who captured the fall were forced by Mugabe’s security personnel to delete the pictures. What if these photographers demanded compensation for the deleted photos? 175 quadrillion (175,000,000,000,000,000) Zimbabwean dollars gets you a whole five (5) US dollars, so you can be sure any monetary settlement will involve a lot of 0s and commas. File this one under ‘extremely serious’. 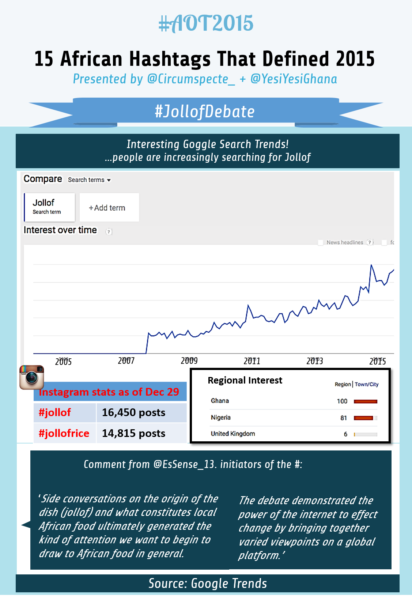 Because whether you’re team Ghana jollof, team Naija jollof, or team something else, you’ll agree that’s exactly what the #JollofDebate is: an issue of the utmost importance. All you need to do is look for the word “jollof” on any social media platform – Instagram alone has over 16,000 “#jollof” posts – and bam, you’re smack in the middle of an age-old love affair that many hold as dear as life. Don’t believe us? Read up on JollofGate. Not surprisingly, various countries – read, Ghana and Nigeria – claim jollof as their own and go to great lengths to defend those claims. Foodie organisation EsSense 13 decided to settle the quandary on October 16, 2015 with a Twitter debate in commemoration of UN World Food Day. 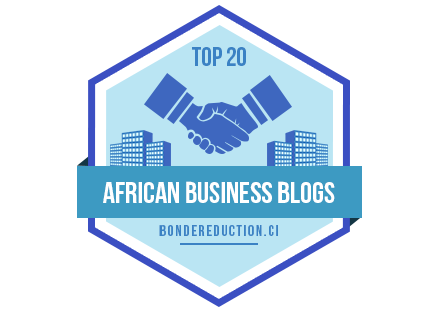 In addition to Ghanaians and Nigerians, they succeeded in getting the larger African Twitterverse on board, including Kenyan, Ivorian and even Senegalese judges – talk about diplomacy! The #JollofDebate wasted no time in jumping from the pan into the fire as lovers and haters alike shared their impressions on which group – Ghanaian or Nigerian – actually does it best. 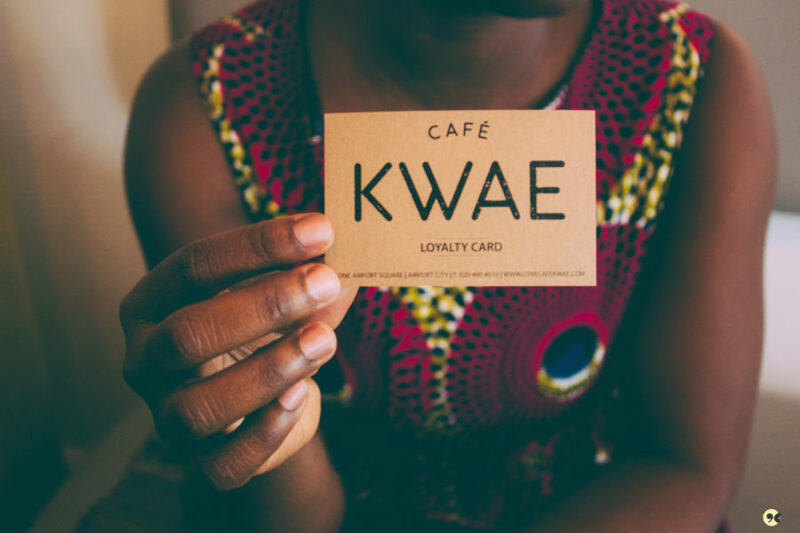 Determined not to be left out of the food talk, the intellectuals came strong with historical references to a jollof ancestor from the grasslands of Senegambia. As they say, food is the great uniter – just imagine what you could do with a legitimate claim to the hearts of jollof lovers everywhere. #SomeoneTellKagame that #MugabeFalls is a classic example of what happens to a man intent on holding onto power when he can barely hold a spoon without dropping its content onto his bib. Paul Kagame who has been president since 2000 sought a change to the constitution to allow him to potentially rule until 2034. The amendment allows Kagame to run for a third seven-year term in 2017, at the end of which the new rules take effect and he will be eligible to run for a further two five-year terms. Despite pressure from the international community on and off Twitter, Kagame carried on with the referendum on December 18. The “yes” vote in favour of the constitutional change won with 98.4 percent, leaving just 1.6 percent of voters opposed. President Kagame announced on December 31 that he will indeed run for re-election in 2017. 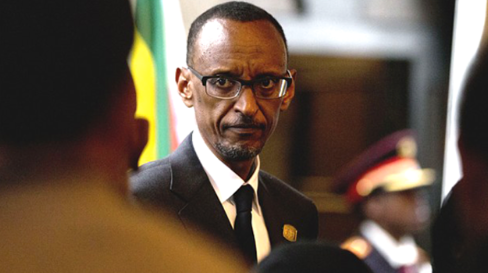 Will Kagame follow in the steps of Grandpa Mugabe? Will we live to see the #KagameFalls hashtag? 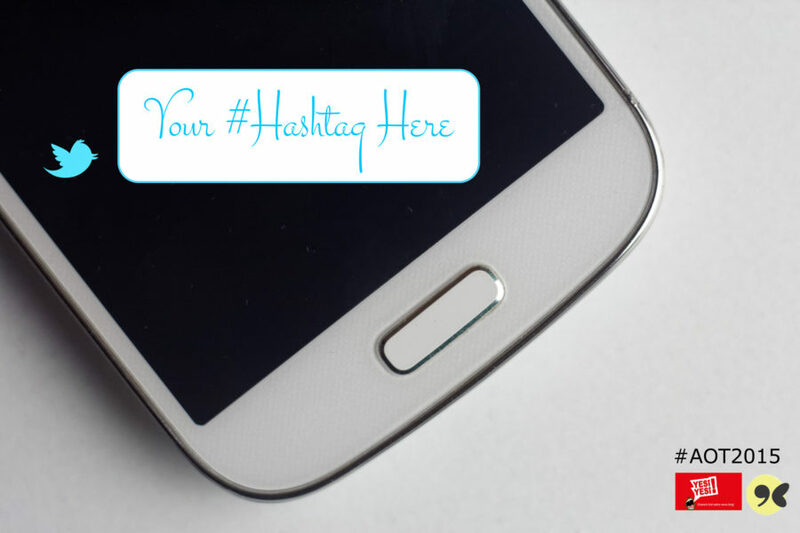 Which hashtag ought to be here? Any of the above you would like to see throughout 2016? Leave a comment and let us know! So the night has come to an end at the 2015 African Twitter bar. The last orders have been called long ago and a burly bouncer is now ushering everyone out of the door. It’s been one hell of a night! 2015 proved a number of things: hashtag activism is more than just useless outrage; Kenyans on Twitter have no qualms about getting into everyone’s business (watch out world! 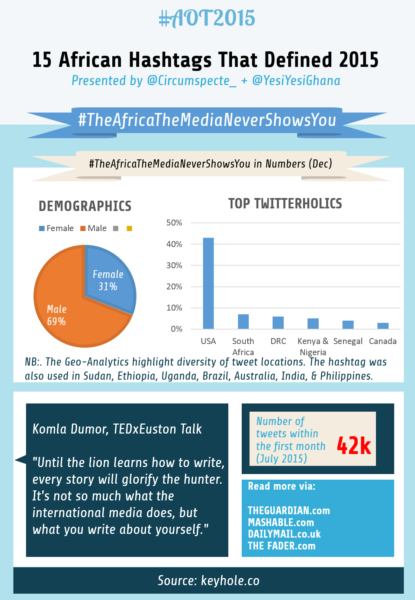 ); countries with considerable internet access and penetration – Kenya, South Africa, Nigeria – are translating hashtags into real actions on the ground, and #TheAfricaTheMediaNeverShowsYou might be here to stay. A message comprised of a hashtag and a string of words not more than 140 characters no longer float aimlessly in the vacuum of cyberspace, but can be part of a wider conversation about our world and everything affecting it. 2016 will have its share of tragedies, triumphs and trivialities, and you can be sure Africans on Twitter will be commemorating each occasion with the appropriate hashtag. 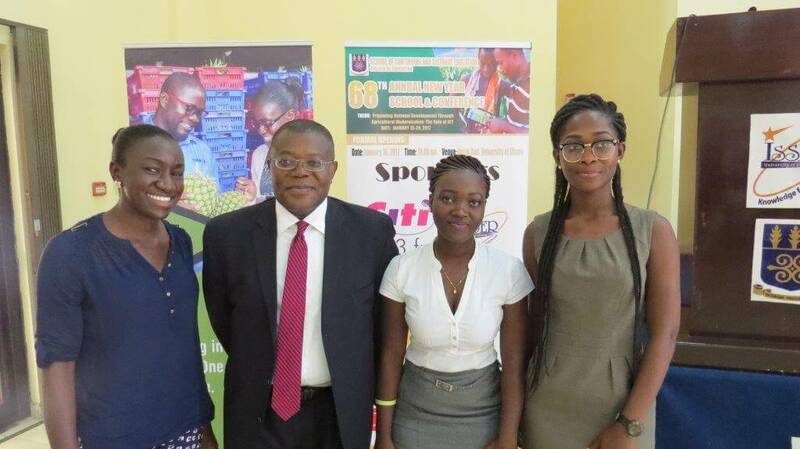 #AOT2015 is a collaborative feature by Circumspecte and YesiYesi Ghana. Download #AOT2015 in PDF.. Thanks Jerome! Yes, we will definitely be keeping an eye on various African elections this year. I’d love to see how #koikoiug fared in 2015 – plus it is definitely one that we should watch out for in 2016. Awesome post – Also, it was interesting to see the demographic info with regard to gender! Thanks for the tip Kirabo, we’ll keep an eye on #kolkolug. And yes – the demographics definitely had us too! #DumsorMustStop was really big for us here in Ghana but in 2016, #GhanaDecides promises to be even bigger as the younger generation expresses its likes or dislikes about the state of Ghana today. We agree, #GhanaDecides will be one to watch! Thanks for your comment! Nice! I wonder how much Gh twitter participated in these hashtags. I took part in some of them. Hopefully in 2016 i will take part in more ‘African related’ Hashtags. I was a big participant in the Jollof debate. I vehemently opposed Ghanaians’ claim of owning the delicious rice. Why would I have done that? Twitter is just fun. Nice write up. Much love from Nigeria. And errmmm, let me have your Twitter handle, please? Great to know Moses. LOL! Yes, Twitter can be much fun. Thanks for the support. You can follow the website at @Circumspecte_ and myself at @jabdulai. See you in the Twitterville!